The sign outside 49 Donovan St., Concord, where more than 70 adjudicative hearings were held on Northern Pass. On April 16, the SEC ordered deliberations to begin at the same address on May 24 and if necessary on June 4 on any motions for rehearing filed by Northern Pass and any objections by the intervenors. Sign up for InDepthNH.org’s free weekly newsletter and Sunday weekender here. Corrections: The SEC May 24 hearing will continue on June 4 if necessary, not through June 4. Also corrects to say it is unclear if the SEC will rule on a motion for rehearing Northern Pass filed – or objections by intervenors – before the final order was written. 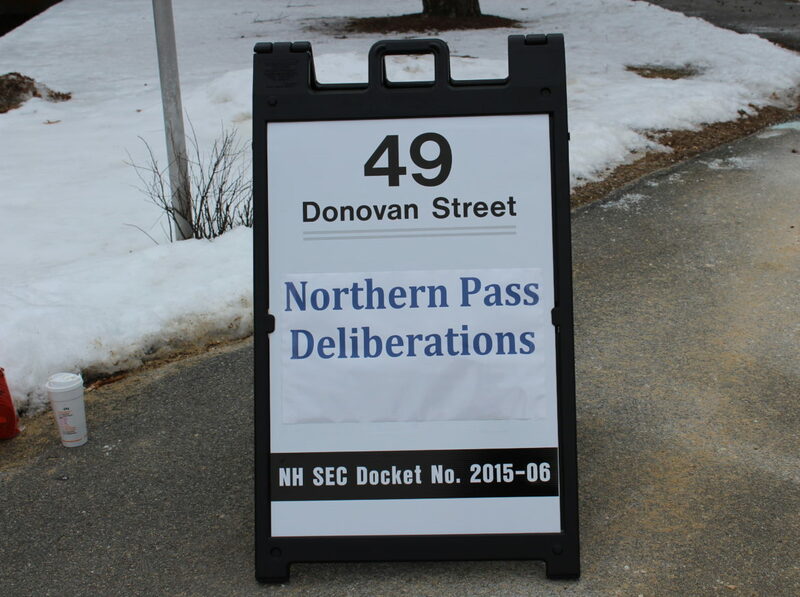 State regulators will hold deliberative hearings on motions for rehearing their denial of the Northern Pass Transmission project starting May 24, although none have been filed since the SEC issued its written order. There is an outstanding Northern Pass motion for rehearing that was filed after the oral order, but it is unclear if it will be ruled on at the May 24 hearing. Site Evaluation Committee Chairman Martin Honigberg’s Monday order said the deliberations will continue June 4 if necessary. They will be held in the same building at 49 Donovan St. in Concord where more than 70 adjudicative hearings were held before a unanimous 7 to 0 vote denied Northern Pass a certificate to build. The SEC issued its final written ruling on March 30 so Northern Pass has 30 days from then to file a new motion for rehearing. Then intervenors who want to object will have 10 days to do so after Northern Pass files its motion for rehearing. Northern Pass spokesman Martin Murray didn’t return a request for comment Monday. Hopkinton attorney Arthur Cunningham, who has represented two intervenors in the process, said he expects Northern Pass will file a complex motion any day now. On Feb. 1, the SEC voted to deny Northern Pass’ application to build a 192-mile high-voltage powerline from Pittsburg to Deerfield to bring Hydro-Quebec electricity to southern New England cutting through New Hampshire. Orderly development is one of four criteria the applicant must prove in order to receive a construction certificate from the SEC. Because the committee cannot issue a certificate unless all four criteria are met, “we could not grant a Certificate even if the Subcommittee were to find in favor of the Applicant on the remaining three prongs. There is, therefore no need to go further,” the SEC said. The SEC had determined orally that Northern Pass was financially able to build the project, but determined it would unduly interfere with the orderly development of the region. The SEC made no determination on the other two criteria required by law in siting energy projects: whether it would have unreasonable adverse effects on aesthetics and whether issuing a certificate to build would be in the public interest. Northern Pass has said it will appeal to the state Supreme Court if they are unsuccessful in this next phase. The company blamed the delay for losing its opportunity to deliver 1,090 megawatts of Hydro-Quebec electricity to Massachusetts as part of that state’s clean energy project. Massachusetts energy officials selected Northern Pass for the 20-year contract but began negotiating with Central Maine Power on its proposed transmission line after the SEC denied Northern Pass’s application, then dropped Northern Pass altogether. Chairman Honigberg said testimony and oral argument will not be heard during the deliberations starting May 24 unless requested by the committee.